Editor's note: This is part of a series of updates on Hurricane Harvey relief funding. You can read the last update here. State officials are still waiting for the federal government to award a $5 billion block grant to help families in need — money that was approved two months ago. Meanwhile, the Federal Emergency Management Agency said it was still paying for more than 11,000 hotel rooms for Harvey victims as of Jan. 29. Texas leaders have estimated it will take up to $121 billion in federal money to rebuild public infrastructure and housing. It’s a huge sum that even state officials acknowledge they won’t get. Still, Gov. Greg Abbott had a rosy outlook this week as he unveiled a cheery report on the state of the Texas economy. "Though tested this year by Hurricane Harvey and other challenges, Texas remains the envy of the nation," Abbott said in a Monday news release. Here’s a review of what has — and hasn’t — been spent so far on Harvey relief. The two biggest sources of federal disaster recovery money are the Federal Emergency Management Agency and the U.S. Department of Housing and Urban Development. $597 million has gone to local governments that have requested help rebuilding infrastructure like roads, bridges and levees. 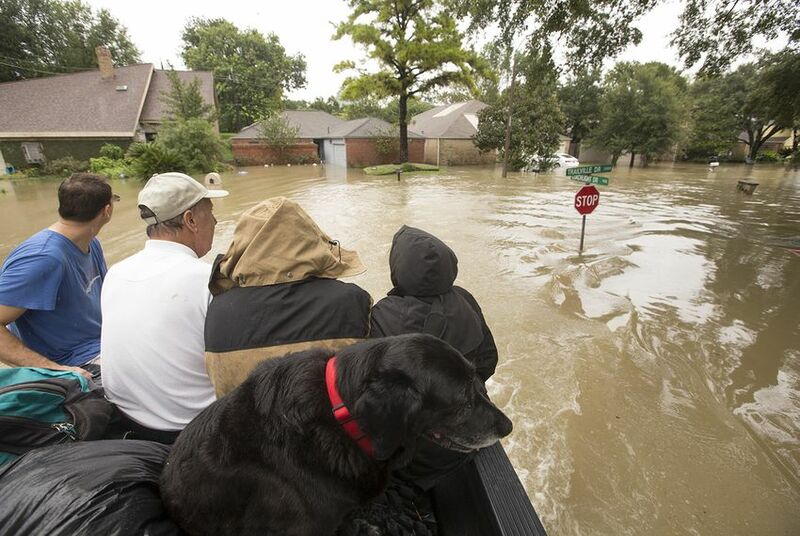 The FEMA-administered National Flood Insurance Program, which enrolls homeowners who live in flood-prone areas that private insurance won’t cover, has paid out more than $8.2 billion in claims for Texans. The federal agency could not say how much money had gone to pay for hotel rooms for Texas residents displaced by Harvey. At Texas’ request, federal administrators extended the hotel program until March 12 for many families. In November, the U.S. Department of Housing and Urban Development announced Texas would receive just over $5 billion for long-term rebuilding efforts. None of that money — intended to fill in the gaps after individuals or government agencies have exhausted all other funding sources — has arrived in state coffers yet. State officials said they were still waiting for the federal agency to accept public comment on the funding, a requirement of federal law. The Small Business Administration’s disaster relief loan program (which is available for businesses and individuals), the U.S. Department of Agriculture’s food assistance program and the Department of Labor’s unemployment program also provide aid during disasters. So far, the SBA has approved $3.1 billion in low-interest loans to homeowners and renters in Texas. Several state agencies have spent heavily on Harvey relief, primarily using federal funds. The Texas Health and Human Services Commission has spent more than $1.1 billion on Harvey relief, most of which came from the USDA’s food assistance program, according to state budget officials. The Texas Workforce Commission has spent more than $20.6 million using federal funds for disaster unemployment benefits. None of the totals include the 90 percent federal reimbursement that state and local officials expect to eventually receive for disaster-related costs, such as debris removal, incurred during and after the storm. Abbott’s office referred a reporter’s questions about state spending to the Texas Legislative Budget Board, which published figures that are up-to-date as of November. One America Appeal, a nonprofit established by former Presidents Jimmy Carter, George H.W. Bush, Bill Clinton, George W. Bush and Barack Obama raised more than $41.3 million for hurricane victims in Texas, Florida, Puerto Rico and the U.S. Virgin Islands. Of that, the nonprofit distributed about $21 million to the Houston Harvey Relief Fund and the Rebuild Texas Fund, spokesman Jim McGrath said. The Rebuild Texas Fund, spearheaded by the Michael and Susan Dell and OneStar foundations, raised $92.1 million for Hurricane Harvey recovery, according to its website. The organization says it has awarded about $7.5 million. Much of that money has gone to school programs in southeast Texas. The Hurricane Harvey Relief Fund, administered by the Greater Houston Community Foundation with the blessing of Houston Mayor Sylvester Turner and Harris County Judge Ed Emmett, raised more than $112 million for Harvey recovery, according to its website. In December, the nonprofit said it had disbursed $64.4 million to local nonprofits for hurricane relief. A spokeswoman for the fund did not respond to a request for more up-to-date information. The Michael and Susan Dell Foundation has been a financial supporter of The Texas Tribune, a nonprofit, nonpartisan news organization that is funded in part by donations from members, foundations and corporate sponsors. Financial supporters play no role in the Tribune's journalism. Find a complete list of them here.